Afghanistan War 1979-89This set contains the 3 colors most used by USSR Army for desert theaters following 1970 ordinances. For example these colors were used during the Afghanistan war during 1979-89. All paints are acrylic and are formulated for maximum performance both with brush or airbrush and will allow us to apply the correct color on our models. 4 jars 17 mL. Water soluble, odorless and non-toxic. Shake well before each use. Each jar includes a stainless steel agitator to facilitate mixture. We recommend MIG -2000 Acrylic Thinner for a correct thinning. Dries completely in 24 hours. Include colors:A.MIG-057 Yellow Grey. 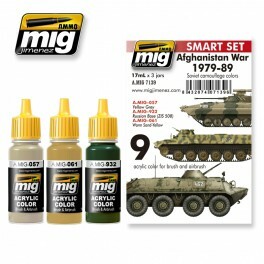 Common camouflage color in use in Afghanistan and also today.A.MIG-061 Warm Sand-Yellow. Sand camouflage color. This paint was also used as base color with green camouflage spots painted over it.A.MIG-932 Russian Base. Standard color for USSR forces of this period.